Life Design Station International Inc (LDSI) got picked up by some stock promotion sites run by Drew Ciccarelli and Gabe Nix this weekend along with some other second rate promotion companies like Penny Stock Explosion and Stock Runway. In a pennystockcircle newsletter email spam sent out over the weekend we have Drew Ciccarelli and Gabe Nix (Global Marketing Media LLC) being paid by Carrillo Huettel LLP (AwesomePennyStock favorite and Kirks favorite before that) to pump LDSI for a 2 day promotion. More information about Drew Ciccarelli and Gabe Nix here. More information about Carrillo Huettel LLP in these posts. The last time I remember an attorney paying for a stock promotion was when it was disclosed the Diane Dalmy was paying Trevor Justus and Brian Cook (Windfall Communications LLC) to promote Genova Biotherapeutics Inc (GVBP) back in September 10, 2009. GVBP was suspended by the SEC on September 23, 2009 and Diane Dalmy was banned by the SEC on September 25, 2009. Coincidentally, Louis Carrillo of Carrillo Huettel LLP was the attorney for GVBP during the spring and early summer of 2009. More information about the Diane Dalmy/GVBP promotion here. This wasn't even Carrillo Huettel's first paid promotion. They paid a promoter to pump KMAG in November of 2011. And according to this Street Sweeper article, Carrillo Huettel LLP paid for two other stock promotions in 2010 (KMAG and PNGM) linked to the Kirks (Skymark Media Group Ltd) who used to be penny pumpers until disciplined by the Canadian authorities. Word is that Skymark sold or gave their spam list to AwesomePennyStocks after being shut down by the Canadian authorities. I had already received research requests from 2 different subscribers on Friday ahead of the paid promotions that came out over the weekend because they both spotted the unusual trading activity for this stock at the end of the day on Friday. Finding information about this stock was not easy because LDSI is a non-reporting company. Since the company is a non-SEC flier we have to rely on the information provided by the company in non-regulated OTC filings, which only became available starting May 30, 2012. It didn't take me long to figure out that something very fishy and probably very illegal is going on with LDSI. 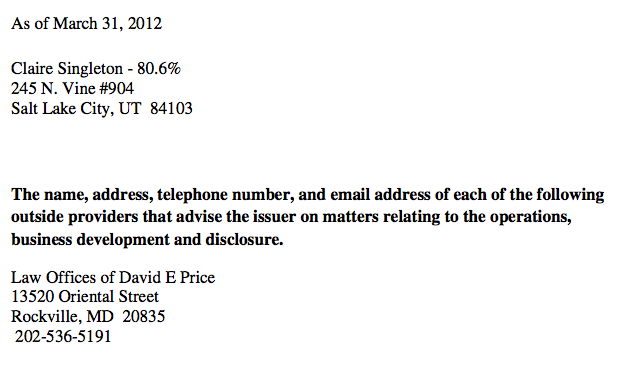 As soon as I saw that attorney David E. Price was involved in LDSI shell all sorts of red flags went up. David Price gets involved with hijacking dead shells and setting up reverse mergers to take over other shells. I think Charms may be related to Belmont but not sure. At the very least they are in the same business only they usually flip slightly dirtier shells than what Belmont has a history of getting involved with. Christopher Davies took over many of Jean Pierre's clients after Jean Pierre got banned. Like many other companies that David Price has gotten involved with LDSI was an abandoned publicly traded shell that was hijacked. According to information provided by the company and available on the OTC website. The shell was called Servinational, Inc until November of 2005. According to LDSI disclosure provided by attorney, David E. Price, the shell was re-domiciled in Nevada from Ohio in September of 2005 and has twice changed names since then (to Shikisai International Inc in December of 2005 and to Life Design Station International Inc in August of 2007). Now here is what really happened. The Ohio entity associated with the publicly traded shell was moved from New York to Ohio in 1990 as stated on the OTC markets, but that shell died in 1999. 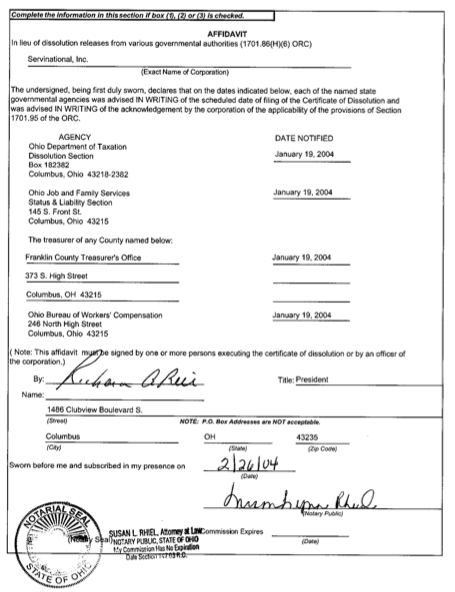 It didn't do any more filings after 1999 with the Ohio Secretary of State, and on February 27, 2004, the entity was dissolved by the state of Ohio. With the entity now dissolved that opened the door for anybody to come in and use the name Servinational, Inc again. And that is exactly what happened in September of 2005. On September 7, 2005, Guy Cohen made a brand new Ohio business entity by the same exact name (#1567664) hijacking the trading symbol. 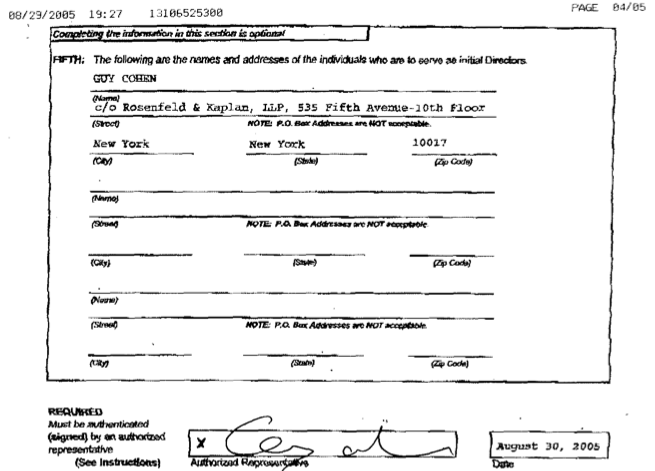 Guy Cohen was involved with banned attorney, John Briner, in the hijacking of Cambrian Systems (CAMS). See this post for more details. 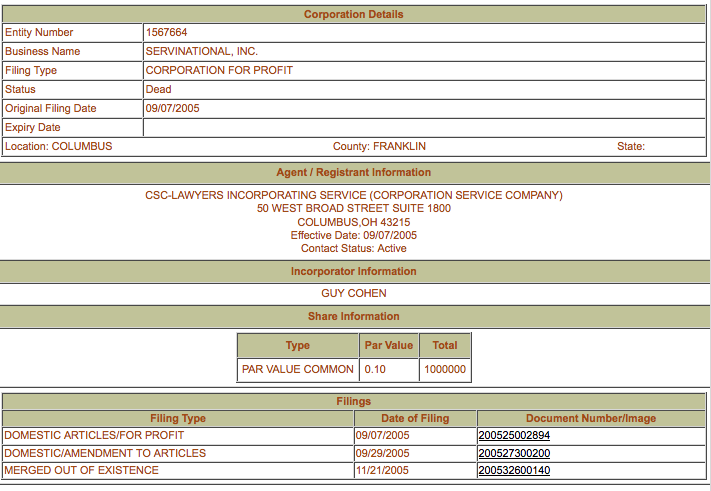 Guy Cohen was also involved in scam company Spongetech when it first went public. I can go on and on about Guy Cohen's past, but I want to stay focused on LDSI (I think everybody gets that Cohen has been involved in lots of shady security dealings). On September 21, 2005 an entity by the name, Shikisai International Inc was incorporated in the state of Nevada. 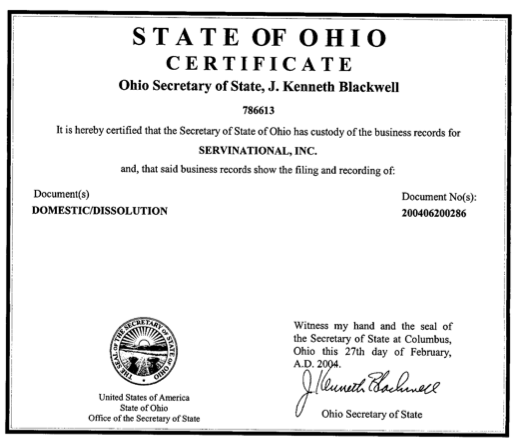 On November 21, 2005 the Ohio Servinational Inc entity was merged into the Shikisai International Inc Nevada entity. The certificate of merger was signed by Sol V Slotnik acting as the Assistant Secretary of the entity. Sol V. Slotnik is an attorney from New York. In 2007, Claire Singleton and Kazuyo Horigane were planted as officers of the shell and the shell name was changed to Life Design Station International, Inc (LDSI). Sol Slotnik, Claire Singleton, Kazuyo Horigane, and Makoto Omori would show up together in another company called Direct Equity International, Inc (DEQI) in this 2007 filing. An identical play with both shells. Makoto Omori being part of a group passing a shell on to Claire Singleton and Kazuyo Horigane with Sol Slotnik acting as the assistant secretary for the filings. 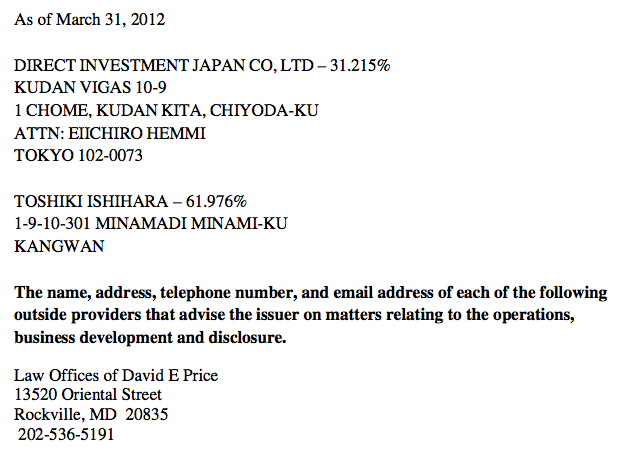 Around 4,000,000 more shares were issued to Direct Investment Japan Co, Ltd at some point. In March of 2012, 60,000,000 more shares were issued to an undisclosed person for services bringing the O/S up to 73,363,188. Claire Singleton has been involved in several shells that ended up being labeled as Cavaet Emptor including HKTU, EXHI, and HMNU. Now Claire Singleton is the CEO of another David E Price shell called Tenguy World International, Inc. (TGWI) with 80% ownership in that shell. She took over control of TGWI in May of 2007. TGWI which is a Colorado business entity was hijacked by Aaron Landon in 2005 after it had been dissolved by the state of Colorado in 2000. The TGWI shell went delinquent again before being cured from delinquency by Claire Singleton in 2007. TGWI is being run like a mirror to LDSI. On May 30, 2012, Claire Singleton raised the authorized share count for TGWI from 500,000,000 to 2,000,000,000. On April 2, 2012, the authorized share count for LDSI was raised from 75,000,000 to 4,700,000,000. Recently LDSI announced that MKJ Development Inc purchased control of the LDSI shell. MKJ Development Inc is a Florida business entity that was started on May 18, 2011 by Lora Thorne of Pineville LA with Lazaro Garcia as the sole officer and director. MKJ Development Inc doesn't appear to have any real business operations only forward looking business plans. Recently TGWI announced that Riverside Development Management Inc purchased control of the TGWI shell. Riverside Development Management Inc is a Florida business entity that was started on May 27, 2011 by Barbara Burkhart of Riverside CA with Chayla Vines as the sole officer and director. Riverside Development Management Inc doesn't appear to have any real business operations only forward looking business plans. These two shells mirror each other so much that even the people behind the shells have started to get the two shells mixed up. Quite embarrassing really. The author of the Disclosure statement for both shells was somebody named "tposten". LDSI announced it has a new website backstagevibes.com. When you visit the website which was just registered on May 18, 2012, it tells you that the website will not be launching for another 50 days. nlpnaturals.com is a new website for another publicly traded shell called Nouveau Life Pharmaceuticals (NOUV). NOUV was formally known as Hybrid Fuels (HRID) and was a Christopher Davies shell. Now the attorney for NOUV is David E. Price. The nlpnaturals website was only just created in April of 2012. So now we have yet another David Price shell that has recently gone through a change of control into a newly created business. The common link between all 6 of those domains sharing the same IP/server appears to be that they were all designed by Anthony Lodl of LDL Designs in Wisconsin. NOUV which was trading at almost $.05/share when David Price took over and the name and symbol change occurred (less than 2 months ago) is now trading at $.0078/share. One of the main promoters hired to pump NOUV during the dumping that occurred over the past several weeks was the same outfit now promoting LDSI, Drew Ciccarelli and Gabe Nix. It appears that both LDSI and TGWI are following the same pattern by creating Florida business entities to merge into the shells and raising the Authorized share counts by billions of shares. Because of the history of the people involved on the inside of both of these shells, the history of the actual shells themselves, and the suspicious recent corporate changes, I'd say that both LDSI and TGWI are set up to be used as insider enrichment scams. Yes the float for LDSI was very low as recently as of March 31, 2012, but I guarantee that is going to change significantly in the very near future (if it hasn't already) especially with the authorized share count having been raised to 4,700,000,000. In my opinion LDSI is a very risky investment. If you decided to play the current promotion make sure you go in knowing that it is a pump&dump and be careful because Ciccarelli and Nix promotions usually don't see gains for very long. It will be impossible to keep track of how many shares are going to be getting issued and to whom to those shares will go because of the non-reporting status of the shell. With 4,700,000,000 authorized shares you can bet there will eventually be lots. As always, thanks for the excellent report nodummy!